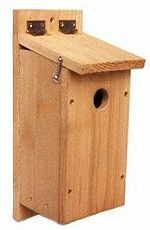 The ash-throated flycatcher nest box is constructed with red cedar, pine, or almost any soft wood. Wood rough-cut on both sides is best so that birds can grip both interior and exterior surfaces. The design has a 6″ by 6″ floor (inside dimensions), 9″ floor to ceiling (inside front), 1 1/2″ diameter entrance hole located 7″ above the floor (to top of hole) and ventilation openings in the floor and under the roof. A hinged roof provides easy access for monitoring and cleaning. Brass shutter hooks secure the roof in a closed position. Always use corrosion resistant screws and hardware. Mount on a tree or post in a secluded area in woodlands between four and ten feet high with partial sun and shade. Out of reach is best to deter the curious unless it is well concealed.